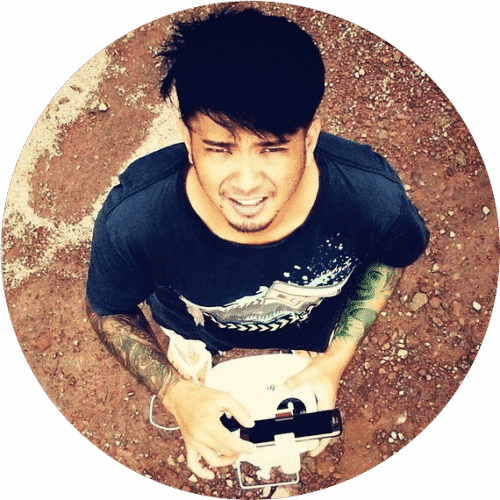 So, you want to become a drone pilot, but not sure where to begin? We are here to help you. Now, what you need to know is that, if you never flew a drone before, you SHOULD NOT enter the world of quadcopters with the most expensive model on the market! Why? Well, even though it might seem easy to fly one of them (when watching others do it on YouTube), one does not simply take the drone out of the box, and perform amazing air stunts on the first flight. That’s where cheap quadcopters come in. Try typing “drone pilot beginner fails” on YouTube, and you will see how people crashed and wasted drones that are worth over $1000, in the first 10 seconds. You will definitely hit a few walls at first, and that is why you want a cheep drone, the one that you won’t cry over in the case you break it. Luckily for you, there are numerous Chinese companies that are offering truckloads of cheap mini quads, and while they don’t have the fancy “return home” functions, they do offer a cheap way of learning how to control a speedy 4-propeller craft even in a tiny apartment. They don’t even need to be registered, and they are loads of fun. But, there is a small problem, and that is picking the right one. 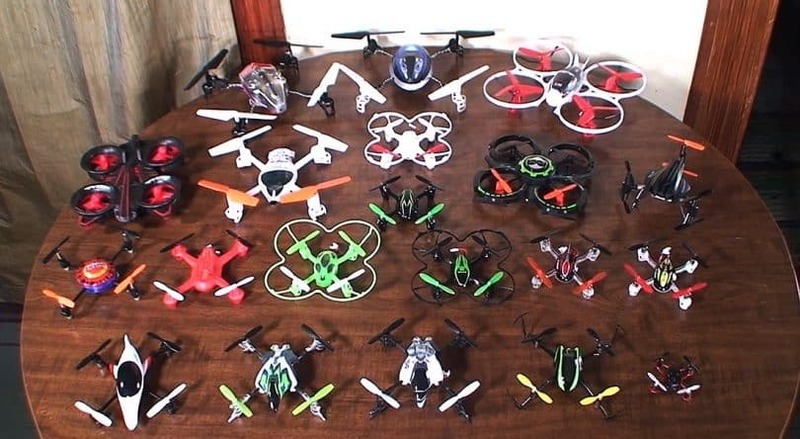 You can simply pick the first cheap quadcopter you see, and either lose propellers every time you crash it, or leave scratches on your walls, palms of your hands, or even your face. Or, you can spend hours searching the web for the perfect beginner drone that is cheap, easy to learn, durable, and safe to fly indoors. Most of the cheap quadcopters come with the same battery life, around 6 to 8 minutes, offer nice and stable flight thanks to internal gyroscopes, have pretty much the same long range thanks to 2.4GHz transmitters, and can be recharged through USB in about an hour. Luckily for you, we have decided to help you out. That’s why we made a list with top 5 of the best, cheapest quadcopters you can find on the market, so that you don’t have to spend hours and hours in searching for the perfect quadcopter. 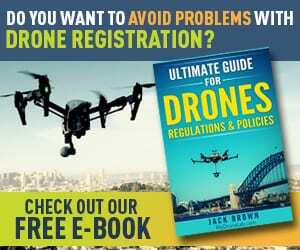 But, before you even consider getting any kind of quadcopter, you need to know about the FAA drone registration requirements. These state that if you wish to become a quadcopter pilot, you need to get up to date with your country’s airspace authority latest regulations. Even though quadcopters look like small toys, they are actually considered flying vehicles and, the bigger they are, the regulations are more strict. In the U.S., drone or quadcopter owners (depending on the weight of the quadcopter) must register it to the FAA before they can fly it legally. You can find more information here: http://www.faa.gov/uas/registration. Now that you know the rules, we can move on to the list. The models you will find on our list don’t have all the fancy features of high-end drones, but believe us, you will be amazed how advanced their features can get. This is one of the most popular training quadcopters on the market, and it’s not expensive. It flies great, and is really easy to get used to. Since it doesn’t weigh too much (around 1 pound) it can handle light wind, but in stronger wind, it will be carried away. It comes with a pretty decent camera, which offers 640×480 pixel videos, and you can take pictures with it, but for that amount of money, you can’t expect UHD footage. As far as the remote goes, the owners claim that it is not complicated, and feels comfortable in the hand. It offers digital trim settings and a digital readout, which display throttle settings, quadcopter battery life, camera settings, trim settings, and so on. The remote also has the 360 inversion button, which allows you to perform aerial stunt flips. 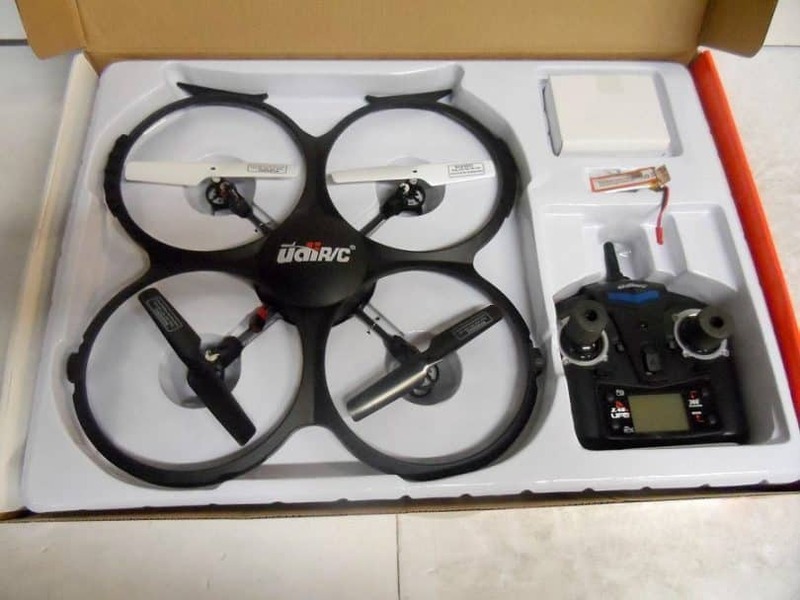 All in all, thanks to its durable frame, this little quadcopter seems like a great one for new pilots to practice with and you can get much more information about it by reading our UDI U818A in-depth review. The futuristic looking Heli-Max V-Cam quadcopter is quite an affordable option for people who want to get into the quadcopter world, but also want to have the ability to take aerial footage. It doesn’t offer the same high-quality footage like the Phantom 3, but its built-in camera is capable of filming 1280×720 at 30fps and takes 1MP still photos. You can even start and stop recording, as well as take pictures, using the transmitter. The quad flies pretty well, and even though it’s really light weight, it can even handle a fair amount of wind. It is a bit more expensive than the little drones you can find in your local shopping mall, but it’s more durable, has a 4-channel controller, and if you need to change parts, it can be easily taken apart. Like most of the entry level quads, it can perform flips with a push of a button. All in all, this is a stable enough quadcopter for beginners, but also offers enough features to make even the more experienced pilots happy. 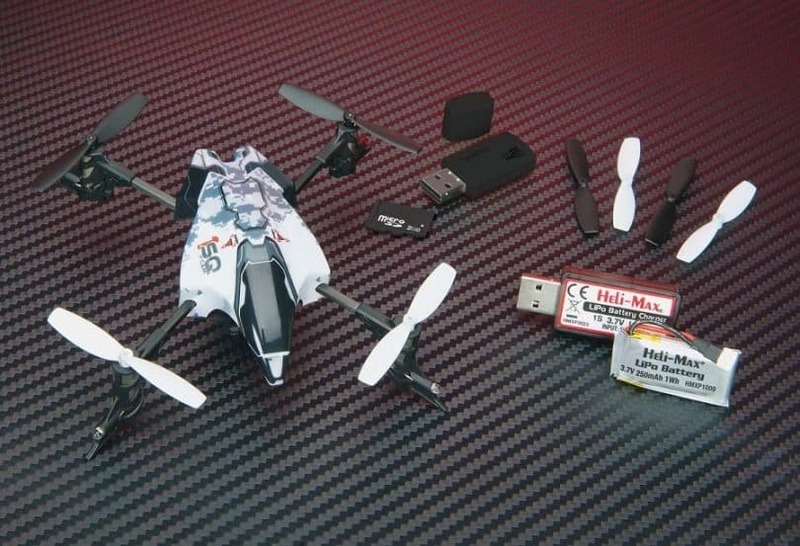 To get more familiar with all that this model offers, check out our Heli-Max 1SQ review. Comes with a 2GB micro memory card. If you interested check its price on Amazon. The X4 H107C comes as an upgraded version of the H107L, and the biggest difference is that this model now includes a built-in 720 pixel camera. Also, a more powerful battery is included, allowing you a bit more flight time. The compact size of this little quadcopter makes it an excellent indoor flyer. As for outdoors, this is one of the few micro-drones that can handle even moderate to slightly heavy winds. You can fly it in two modes, novice, and expert. The first one is for beginners, and it allows you to get used to the controls. The expert mode is meant for when you start feeling more confident and want to achieve higher speed and more aggressive flying. This mode is activated by pushing the right stick down until it makes a click and the controller screen shows “expert”. One of the best features of this little speedster is that it is very durable, and by the words of its owners, it is practically indestructible. 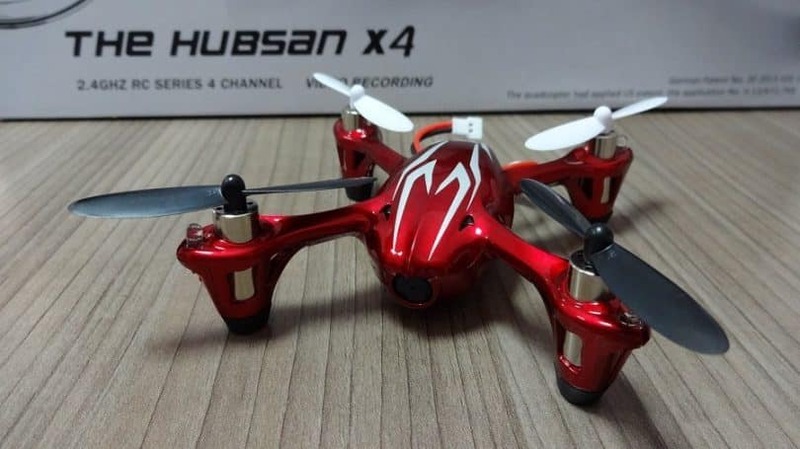 A great quadcopter for beginners, with a low price, and to find out more about all the bells and whistles of this model, read our Hubsan X4 in-depth review. In the case you are looking for a quadcopter that is cheap, capable of flying, but also climbing walls like a spider, this is the perfect one for you. What is even more interesting, is the fact that you can control it with your smartphone or tablet. 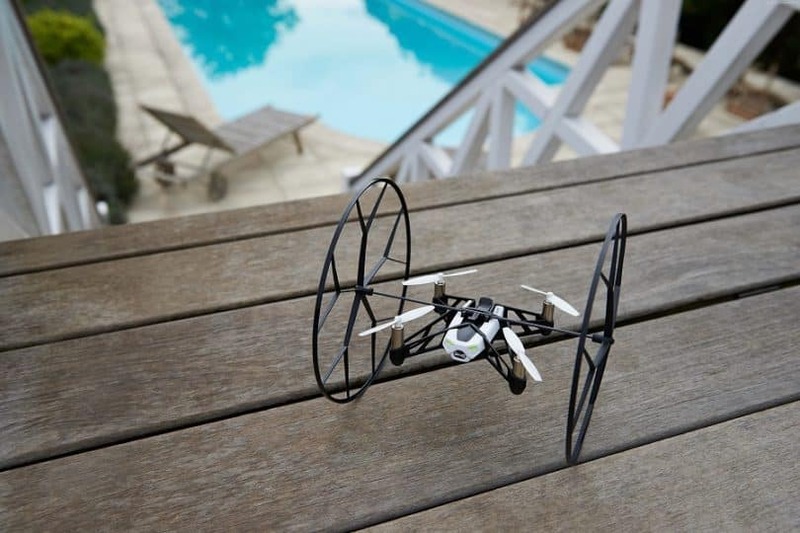 The Parrot MiniDrone Rolling Spider comes with detachable wheels on both ends, allowing you to fly it as a regular drone, or to turn it into a wall climbing, ceiling running “spider”. All in all, like most of the micro drones on the market, flies nice, offers low-res pictures and tons of fun while you fly it. But, none of them are capable of going into “spiderman” mode like this one, and that is why we decided to put it on our list. If you want to get more familiar with this model, we suggest that you also take a look at our Parrot MiniDrone Rolling Spider review. This quadcopter is actually one of the more heavier and durable training ones available on the market. By the words of the owners, this quadcopter is capable of handling and flying nicely even with moderate winds. The owners also said that controlling this drone is a real pleasure, and that it can go as fast, or as slow as you want it to go. Even more, the controller comes with buttons that are in charge of aerial acrobatics. The UX5C also comes with a forward-facing 720p camera and 2GB SD card. 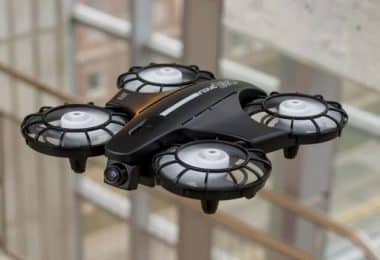 The ability to record your flights, as well as a few features like the headless mode, return home button, one-button flips, and barrel rolls, make this full size quadcopter an excellent one for people that have never flown a quad before. Who is this type of product for? Cheap quadcopters are mostly meant for people who are new in this niche, and who want to learn how to fly first, before they can move on to more expensive models with more serious features. Since the price of these quads is low, when crashing their drone, most people don’t even bother with ordering new parts and changing them, they simply order a new one. 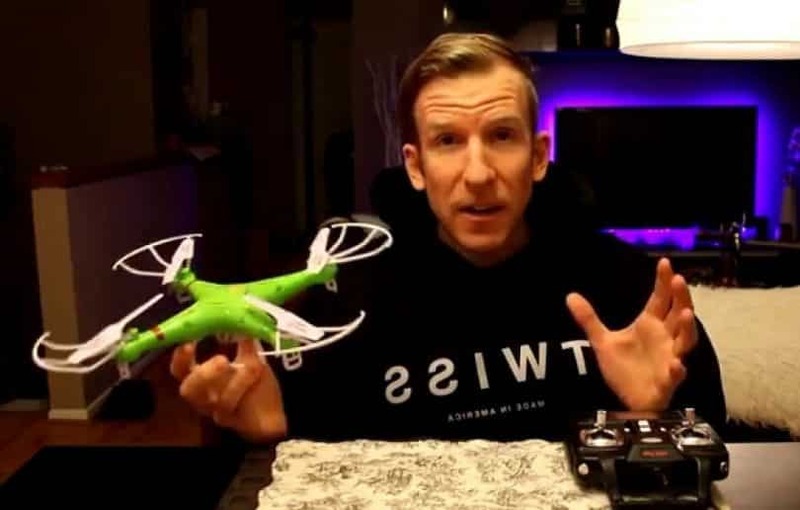 If you are into quadcopter piloting, without any previous flying experience, and not willing to spend too much money a cheap quadcopter is exactly what you want to start with. Trust us, once you enter this world, there is no going back, and pretty soon you will ask us to write an article about best high-end quadcopters available on the market. Why are cheap quadcopters cheap? Well, it’s simple, they are cheap because they don’t come with tons of electronics inside them, they are usually made of cheaper materials, and offer far less features than the high end quadcopter models. Their lifetime is also shorter, due to the use of cheaper, lower quality motors, and the lack of all those GPS orientation and flying assistance (which makes hitting objects and crashing much easier, and frequent). And, as we already mentioned, they are meant for training and for good old fun, and no one will cry if they break it, they will simply order a new one. When looking to buy a cheap quadcopter, you must have in mind that some features have to be sacrificed. For example, you cannot expect a $50 quad to come with a 20 minute flight time, or to record flight in 4K resolution. Just like with most things in life, the more you pay, the more you get. So, with cheap quadcopters you can forget the”follow me mode”, or taking your quad to unbelievable heights, and settle for cheap flying lessons and hours and hours of fun along the way. For learning how to fly and generally, for having fun, you need to find out what features the drone you plan to buy offers. So, we have decided to create a short list of features to have in mind when looking for a quadcopter, just to make sure you end up with the right one. Control options – This mostly depends on what you plan on doing with the drone. For example, if you just want to learn how to be a quadcopter pilot, and are not interested in taking pictures and filming, then you need the basic controller, without extra buttons to start/stop recording. However, we do recommend that you look for models that have trim control buttons, so that you can fine tune your quad and have better control over it. Battery life – This is an important aspect when thinking about buying a quadcopter. However, have in mind that, since we are talking about cheap quads, you can’t expect it to fly more than 7 to 10 minutes. The 10 minute flying ones are rare, and you can consider yourself pretty lucky if you get one that offers that much flying time. Remember to always read the owners’ experiences. This way you will have an idea of how much flying time you can expect from the model you plan on buying. 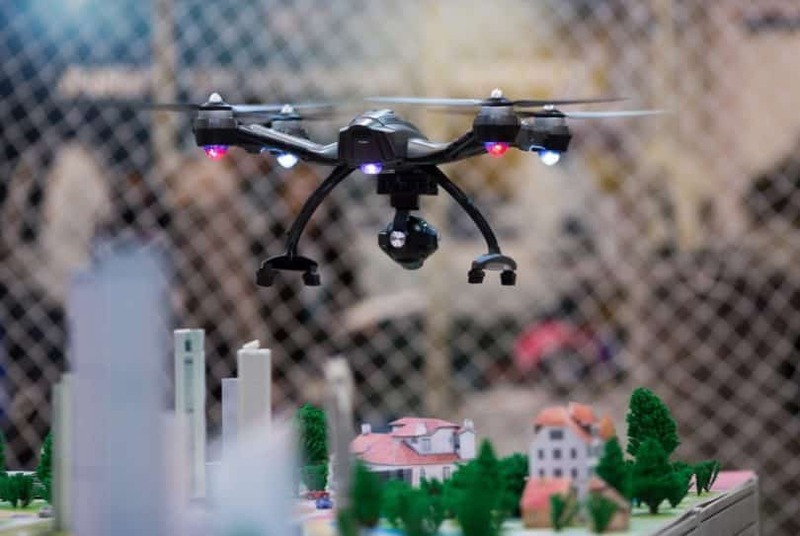 The camera – If, besides learning how to fly a drone, you are also interested in making videos of your flights, or taking birds eye perspective pictures, you will need a quadcopter that comes with a camera. Now this can be really tricky… Yeah, the manufacturer does claim that it is a2MP, or 5MP, or even 8MP camera attached to the drone… But, with a price of, for example $50 or less, it is hard to believe that the camera is that good. When you think about it, the camera itself should cost more, right? 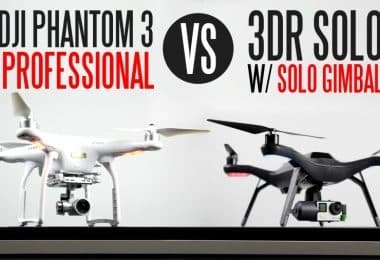 Once again, check the owners’ reviews, and spend hours on YouTube… Or, find a cheap quadcopter that is capable of handling some extra load, learn how to fly, and maybe attach a GoPro camera latter, when your piloting skills are much better. 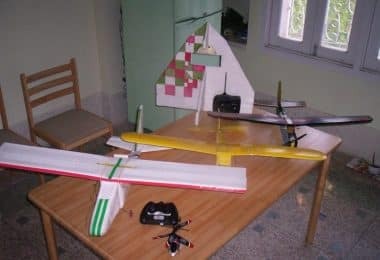 For example, some of the drones don’t even come with a protective guard, which can actually mean that you will have a short period of fun before you break the propellers. 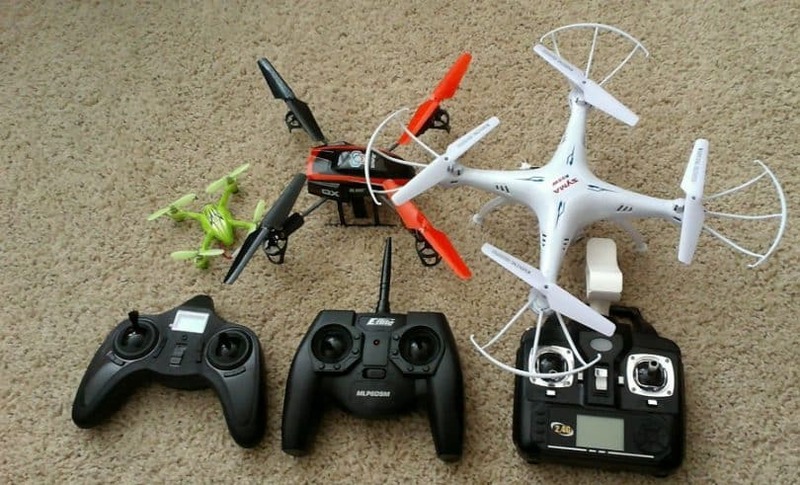 So, if you want to prolong your flying lessons and the fun factor, consider investing a small amount of money in quadcopter accessories like prop guards, extra batteries, spare blades, and so on. Again, check the reviews, find out what the “soft spots” of your future drone, and buy extra parts if you don’t want to spend time waiting for a new quad to be delivered. A friendly advice – look for quadcopters that already come with extra accessories. This way you will save both money and time. 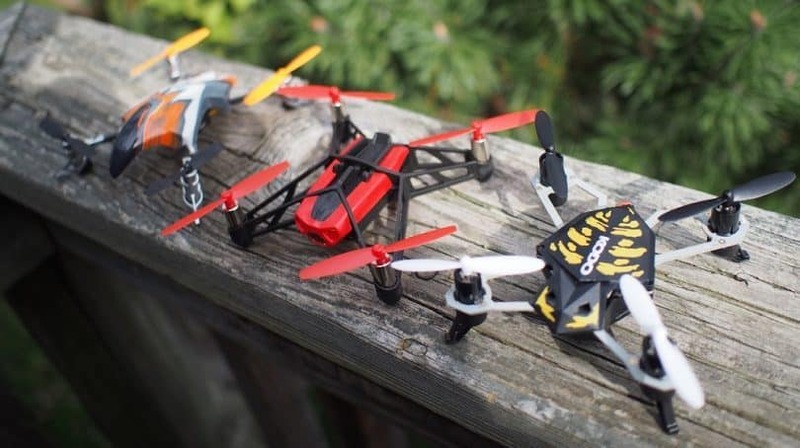 Quadcopters offer hours and hours of fun. They are addictive, and once you start flying, you will never want it to end. Also, when you master the flying skills, you will want to switch from a cheap quad, to a more serious and more expensive model for sure. But, before getting there, you first need to decide what model to buy, and considering that there are literally thousands of models available on the market, finding the right one can be pretty confusing. We can only hope that our article has helped you in understanding the world of cheap drones better, and that after seeing the 5 models we offered, you have an idea which model to buy. After reading the most important features, and seeing the best 5 models on the market, you will have the necessary data to make an informed decision. Now that you know everything there is to know about cheap quadcopters, you will not have a problem in finding the perfect one for you. If you have questions you want to ask, feel free to leave a comment, and we will do our best to find the right answer as soon as possible.